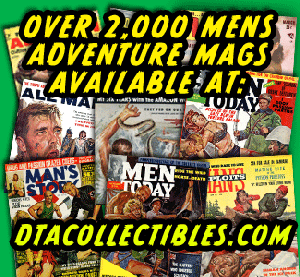 Men's Adventure Magazines: Killer elephants, tigers, snakes and lobsters?…Oh yeah! Killer elephants, tigers, snakes and lobsters?…Oh yeah! 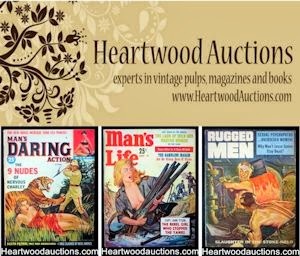 Last year, I co-wrote an article about “killer creature” man vs. animal themed stories in vintage men’s adventure magazines for HORRORHOUND, a nicely-produced periodical about horror and science fiction movies, books and collectibles. I wrote the article with Wyatt Doyle, my co-editor for the series of men’s adventure magazine story anthologies we’re publishing via his indie book company New Texture. We are both fans of the rip-snorting, often way-over-the-top animal attack stories that were common in men’s pulp adventure magazines published in the 1950s, 1960s and 1970s. 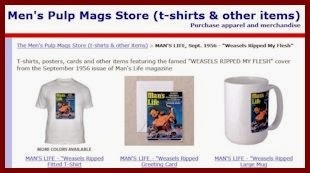 In fact, we borrowed the title of the most famous men’s pulp mag killer creature story of them all as the title of our first book anthology — WEASELS RIPPED MY FLESH! That story, which is included in our book, was originally published in the September 1956 issue of MAN’S LIFE. Its cover features the now iconic man vs. weasel cover painting by Wilbur “Wil” Hulsey (sometimes credited as Will Hulsey). Many rock music fans assume Frank Zappa coined the phrase “Weasels Ripped My Flesh.” But he simply helped popularize it when he used it as the title of a Mothers of Invention album in 1970. Zappa had a copy of the September 1956 issue of MAN’S LIFE. And, though he borrowed the title of the cover story, he decided not to use Hulsey’s painting for the cover of the Mothers’ album. Instead, he commissioned artist Neon Park to create a new one. According to legend, Zappa showed Park the MAN’S LIFE cover and asked: “What can you do that’s worse than this?” By which, I’m guessing he meant even weirder. Park came up with a gonzo image of a guy slashing a bloody gouge in his cheek with what might be described as an electric weasel razor. He based it on a Schick “20” electric razor ad he’d seen in the October 1953 issue of the SATURDAY EVENING POST. Park’s painting is definitely weird. But I’m not sure it’s weirder than Hulsey’s killer weasel masterpiece. I was recently reminded of how much I love Hulsey’s artwork and killer creature artwork and stories in general while reading another fairly rare issue of MAN’S LIFE from July 1957. It features a Hulsey painting showing an angry wild elephant lifting up a highly-distressed damsel with its trunk. She’s wearing a blouse that’s bright red, a color that helped grab eyeballs on newsstands and was commonly used for the typically skimpy clothing of women shown in men’s pulp mag cover paintings. Her blouse is halfway torn off, revealing ample cleavage which, of course, further enhances the cover’s eyeball-grab factor. Yes, I realize this story is outdated and politically incorrect. It’s also racist, sexist, ethnocentric and anthropocentric. But it’s a classic, gritty example of manly pulp fantasy that’s fun to read. The Wil Hulsey painting is great. And, even the teaser subheads used for the story are cool. The story is credited to J.D. O’Brien, who was supposedly the hunting guide, telling the story in first person. In reality, the name and story were made up by some pulp writer; a “hack” some people might say, though I’d say a pretty good one. The teaser subheads (a written form of pulp artistry in themselves) were probably created by the editor of MAN’S LIFE at the time, Harold Straubing, or by one of his Associate Editors: Joe Genalo, Charles Ferlin or Ed Gerard. The art director, who wisely chose Hulsey for this assignment, was Bob Webber. In the 1950s, the MAN’S LIFE editorial teams and their readers had a special fondness for killer creature stories. Many issues from those years had three or more sandwiched in between other types of action and adventure yarns, war stories, exposes, sexposés and cheesecake pinup pics. The July 1957 issue has four of them, all with terrific, blood-tinged titles and subheads. The, er, lobster tale is an example of just how incredibly wild and crazy many of the killer creature stories in men’s adventure magazines could be. It’s the kind of absurdly, gloriously gory stuff that makes certain horror movies fun to watch. Which is why our article about such stories fit right in in HORRORHOUND magazine. The animal attack stories in the July 1957 issue of MAN’S LIFE are classic examples. 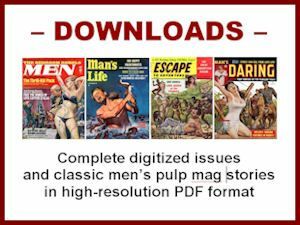 If you’d like to read them for yourself but don’t own that issue, you can download a complete PDF copy from the MensPulpMags.com virtual newsstand. Yeah, I charge a few bucks each for them. But that’s a lot less than you’re likely to pay to for old print copies of the issues I offer, if you can even find them. 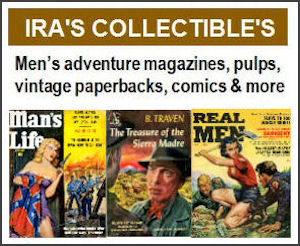 In addition, your purchase will help keep this blog alive and — encourage me to upload scans of more classic issues for your reading pleasure.